This double-walled, LED-illuminated glass sculpture is a playful homage to the familiar form of a lightbulb. Designers Liz Ross and David Westby set out to create a snow globe-inspired light, only to find that lightbulbs and flurry-filled domes already shared some design history. Their eureka moment produced this playful homage to the familiar form of an incandescent bulb: a handblown, double-walled glass sculpture lit by a battery-powered LED. This cord-free design makes a portable, stylish light source and a brilliant addition to your bedroom or office decor. Designed in Vermont; made in China. Read about how Liz and David accidentally invented the Nightbulb on our blog. Married artists-turned-professionals Liz Ross and David Westby were living fast-paced Los Angeles lives when a bout of carpal tunnel required Liz to take a long rest. Released from daily work pressures, her mind drifted. A New York City native, “I was always homesick for the East Coast,” she says. She missed autumn leaves. A lot. In 2005, the couple moved to rural Vermont to resume being artists. Inspired by their peaceful new surroundings, they hit upon the idea of making artistic snow globes that magically evoke beautiful, silent moments in nature. The Nightbulb grew out of a snow globe concept, because, well, you know how an artist’s mind drifts. Wipe clean with a gentle glass or surface cleaner. To access the battery case, remove the magnetic bottom plate, install batteries and replace the plate. Contains high quality 600 Lumens LED bulb that will lasts over 10,000 hours. Requires 3 Triple A batteries. This lovely little light stays on my nightstand. It gives off a soft cool light for my comings and goings before bedtime. My daughter loves this night lamp, it is unique and cute. Great little night light on the stand next to my bed. It's very unobtrusive and gives just the right amount of light, when getting up in the darkt. Brightness dimmed throughout the night at each use, and then failed to work after two weeks of nightly use (approximately 120 hours - nowhere near the estimated hours listed in the FAQ page). Very unhappy with the product. The design was great. The packaging done by Uncommon Goods was thorough. The first one arrived damaged (the glass bulb/jar unit detached completely from the base which holds the LED/Battery). Customer service was so nice and sent a new one, again packaged perfectly, but one more time, the white opaque paint used at the base of the bulb/jar had cracked. My husband suspects that the glue used to hold the base to the glass was stronger than the paint, causing it to fracture and separate. Overall, great design but just too fragile for shipping. 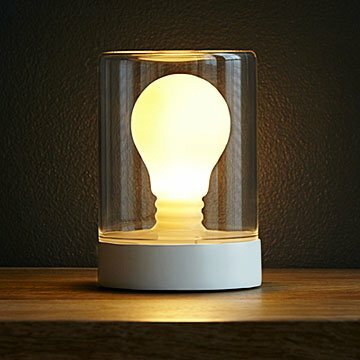 Well Made Little Lightbulb, A Lot Of thought went into this Lightbulb, People just love to turn it on, I very glad I bought this, Thanks to the two Inventors. I just love this light. It can be used anywhere and it is quite a conversation piece. My son in law built a secret room in a wall in my grand daughter's bedroom...light is perfect and safer with no electrical cord.